Throughout history, plant-based diets have always played a role, whether for religious, political, or social reasons. The concept of vegetarianism first gained cultural prominence in the 8th century BC, originating from a religious predecessor of hinduism in Indian cultures. But even in Europe, during the 6th century BC, certain schools of Greek philosophy rejected the consumption of meat for ethical and, later on, for economic, ecological, or health reasons. 1) Leitzmann, C. & M. Keller (2010): Vegetarische Ernährung. Stuttgart: Verlag Eugen Ulmer, 2. Ed., p. 37-38 The term ‘vegan’, however, only emerged in 1944 and is a contraction of the first and last syllables of the word ‘vegetarian’.2) The Vegan Society: History. Available at: https://www.vegansociety.com/about-us/history [12.06.2018]. 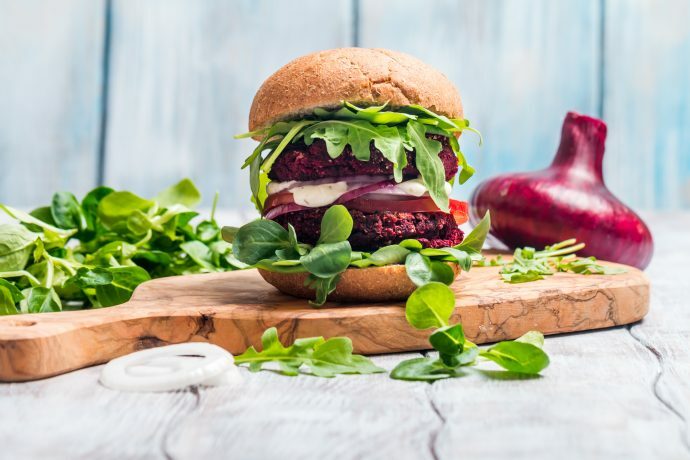 Vegan meat alternatives such as tofu, vegan burgers, schnitzels, and sausages are available in many variants – for example, based on soy, seitan, or lupins. There are also many vegan alternatives to milk, yoghurt, and cheese. These are often based on soya, nuts, or cereals. Dairy-based milk, cheese, yoghurt, and butter. Animal-based processing agents such as gelatine, isinglass (a substance obtained from the dried swim bladders of fish), and egg whites, all of which are used for the clarification of beverages such as fruit juices, beers, and wines. The high consumption of animal products is one of the main causes of widespread lifestyle diseases such as obesity,8) Tonstad S, Butler T, Yan R, Fraser GE. Type of vegetarian diet, body weight, and prevalence of type 2 diabetes. Diabetes Care [Internet]. American Diabetes Association; 2009 May [cited 2017 Sep 11];32(5):791–6. Available at: http://www.ncbi.nlm.nih.gov/pubmed/19351712 [11.06.2018] diabetes,9)Tonstad S, Stewart K, Oda K, Batech M, Herring RP, Fraser GE. Vegetarian diets and incidence of diabetes in the Adventist Health Study-2. Nutr Metab Cardiovasc Dis [Internet]. 2013 Apr [cited 2017 Sep 11];23(4):292–9. Available at: http://www.ncbi.nlm.nih.gov/pubmed/21983060 [11.06.2018] and cardiovascular disease.10)Huang, T., B. Yang, J. Zheng, et al. (2012): Cardiovascular disease mortality and cancer incidence in vegetarians: a meta-analysis and systematic review. Ann. Nutr. Metab. 60, p.233–240 11)Dinu, M., R. Abbate, G. F. Gensini, et al. (2017): Vegetarian, vegan diets and multiple health outcomes: A systematic review with meta-analysis of observational studies. Crit Rev Food Sci Nutr. 57, p.3640–3649 A varied and balanced plant-based diet can help minimise the risk of developing these diseases. In its position paper on the subject, the Academy of Nutrition and Dietetics writes that a well-planned vegan (as well as vegetarian) diet is suitable for all phases of life, including pregnancy, infancy, childhood, and adolescence. 12) Melina, V., C. Winston & S. Levin (2016): Position of the Academy of Nutrition and Dietetics: Vegetarian Diets. Journal of the Academy of Nutrition and Dietetics 116, no. 12 (December 2016): pp. 1970–80. Iron deficiency is the most common nutrient deficiency worldwide.13)WHO (2001): Iron Deficiency Anaemia, S. 15. Verfügbar unter:http://www.who.int/nutrition/publications/en/ida_assessment_prevention_control.pdf [11.06.2018] Since the body cannot produce iron, it must be ingested in sufficient quantities through food. 14) Heinrich, P. C. et al. (2014): Löffler/Petrides Biochemie und Pathobiochemie. Springer, p. 659, 736–780 15) UCFS Health: Hemoglobin and Functions of Iron. Verfügbar unter https://www.ucsfhealth.org/education/hemoglobin_and_functions_of_iron/ [11.06.2018] Iron deficiencies can usually be counteracted by maintaining a healthy and varied diet, and by regularly eating iron-rich foods such as sesame, red lentils, kidney beans, or tempeh. According to the World Health Organization (WHO), about a third of the world’s population is affected by insufficient iodine intake. In Europe, as much as half of the population is affected.16)WHO (World Health Organization) (2004): Iodine status worldwide: WHO global database on iodine deficiency. Available at http://apps.who.int/iris/bitstream/10665/43010/1/9241592001.pdf p.12 [11.06.2018] The body can receive an adequate supply of iodine by consuming algae or algae-based supplements such as spirulina, or adding iodised salt to one’s diet. However, an overdose of iodine can cause health problems. ProVeg provides further information on the topic in this article on how to prevent iodine deficiency with iodine-containing foods. More and more consumers are questioning the consumption of animal products. This is also reflected in the increasing demand for plant-based alternatives. While plant milks, for example, have been consumed for centuries in various cultures, their popularity has skyrocketed over the past decade. Additionally, cruelty-free substitutes (such as vegan sausages or burgers) are improving all the time and it is increasingly difficult to tell them apart from the ‘original’. Get to know the best meat, egg, and milk alternatives here. 2. ↑ The Vegan Society: History. Available at: https://www.vegansociety.com/about-us/history [12.06.2018]. 12. ↑ Melina, V., C. Winston & S. Levin (2016): Position of the Academy of Nutrition and Dietetics: Vegetarian Diets. Journal of the Academy of Nutrition and Dietetics 116, no. 12 (December 2016): pp. 1970–80.